It’s so obvious that I can’t believe I’ve never tried it! Or maybe I did, once, when I was little. I’ve used the old stand-bys of wax crayons and rubberbands. I think I’ve probably even added stickers to finished eggs. Finally, during a lace-dying fiasco last year, I realized how great it would be if stickers would actually work on Easter eggs. And they did! I used letters and butterflies that I had on hand, and then Greg got creative with tape and made some shapes of his own. I just used a regular egg dye kit and experimented. 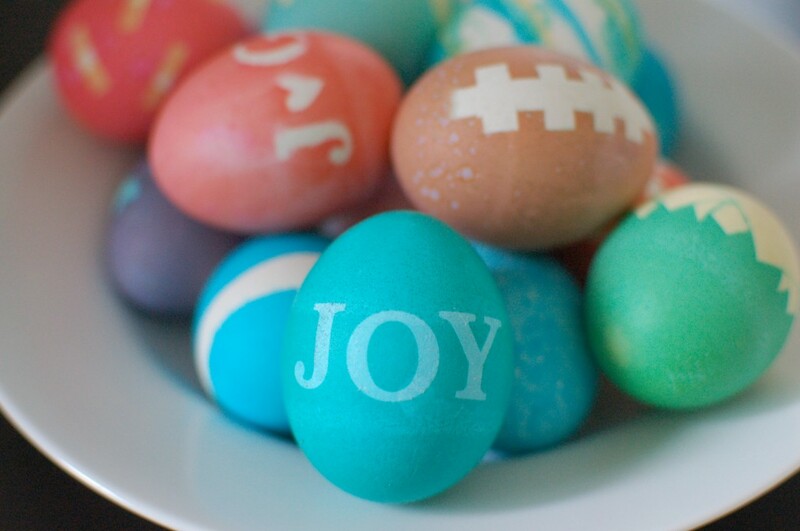 For a more subtle look, you can dunk the egg briefly in dye, dry it, apply stickers and stick it back in the same color (like the JOY egg). 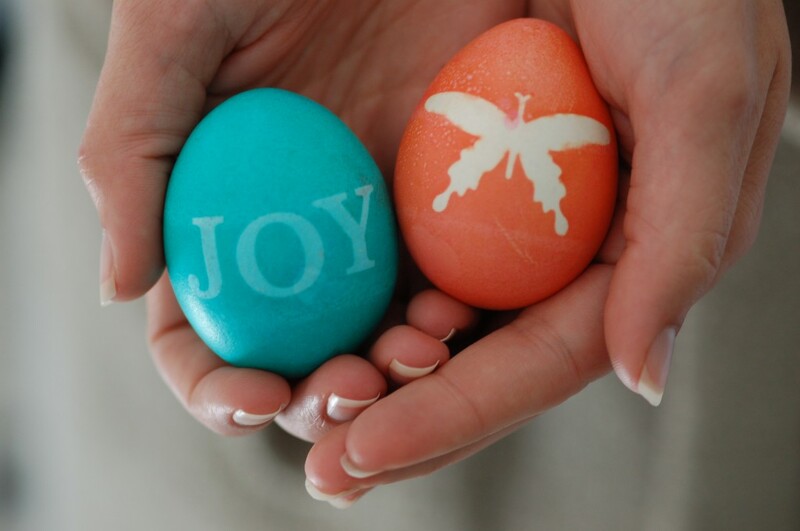 For a real pop of white, put the sticker on the egg before using any dye and let it soak for several minutes (like the butterfly!). The yellow, blue and green butterfly egg was my favorite, and it involves several layers of dye and stickers. First, decorate the white egg with several stickers. Dip it in yellow dye. Take off some or all of the stickers (the stickers that you leave will end up white shapes, the ones you remove will end up blue). Add a few new stickers (these are the shapes that will end up yellow). Now dip the egg in blue dye and, after drying and sticker removal, you’re done! Most the egg will be a shade of green, while some shapes will be yellow, blue or white, depending on when the stickers were on or off! Try overlapping shapes at various stages to add dimension. Greg used tape to make the laces of a football — so clever! And it’s the first time I’ve ever seen someone intentionally creating the brown that comes from mixing primaries together. He also made some borders and stripes, while I stuck mainly with the cutesy butterflies and letters. 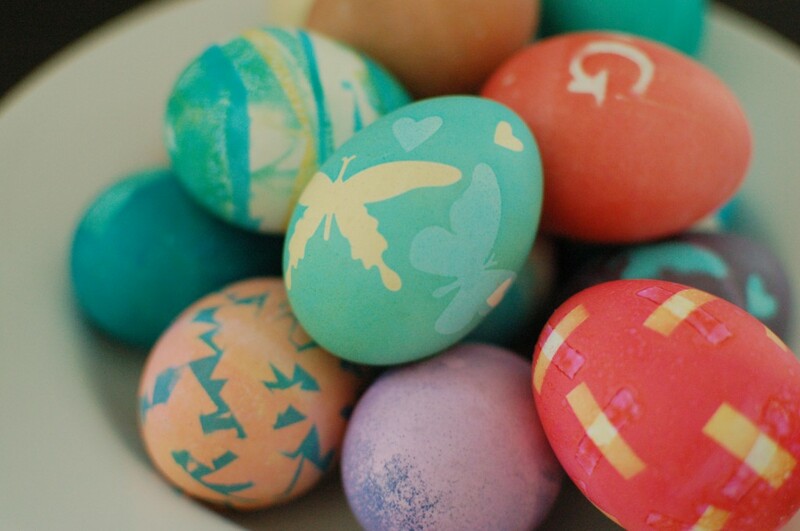 I’m so excited to try this again with more stickers — it’s such a clean and modern way to dye Easter eggs!